As special service we offer every year a small paradise for children where the offspring can create a new world with paper and pencil. 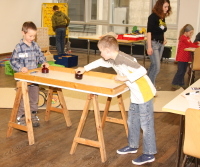 They are allowed free play to their creativity with pearls and logs of wood and can get together and play some games. Imagination has no limits.